At 9:08pm BBT, the live feeds came back on for the HOH Endurance Comp! Let's dive in!! GM: "Come on, Spence, ya got it buddy!" Spencer: "I bet I held on longer than y'all thought I would!" Andy: "I wish we had music!" GM: "Ya know, this is hard with a broken toe." Spencer: "Good job, guys! Y'all have been up there twice as long as I was." Andy: "I think McCrae would've kicked a** in this." GM & Andy are slipping & sliding..more Andy than GM. Foam bubbles start to flood the floor. Andy messed up his knee. GM is loving the glitter coming from above. She's making "glitter angels" on the roller rink floor and accidentally inhaled some. **Turn on the live feeds to watch the aftermath!! I guess the roller skates they talked about practicing with last night were for endurance afterall. Shocker! Spencer is the 1st one out of an endurance comp. It doesn't matter the dudes got 50k coming his way regardless. If GM and Andy are smart then Spencer will be in the final 2 no matter what. On a side note, the Eliminators was the best "floaters" alliance in the history of BB. If Andy and GM are smart then Spencer will be in the final 2. On a side note... The Eliminators is the best "floaters" contrived alliance in BB history. Wow GM won already! How weak is that?! Can you even call that an "endurance" comp? McCrae said it earlier on the feeds today and I feel the same way he's gonna be regretting the # he wrote down for the tiebreaker answer in the F4 HOH comp the rest of his life. Andy won but he was way under the correct answer leaving a lot of room to have beaten him if McCrae didn't guess way over. And like I had said and the 3 of them just said there's no way McCrae would've lost this endurance comp. And he would've been sitting there on Finale night with a 50/50 shot with that crapshoot finish the Jury member's answers comp. Congrats to GM. Andy better win the next one or else its 3rd place for him. I was just gonna ask if anyone thought they were even gonna make it till BBAD came on and boom it was over. We got a whole 15mins of an endurance comp on the feeds. Woohoo! They can probably show this whole comp in its entirety on the show, no need for time lapse. Hell they may even have to loop the footage to make it seem longer. Yet another worst to add to the list from this season. What does this mean. Part 1 what does she get to do. Andy has won 4 comps himself and will have to win 2 more if he's gonna be in the F2 most likely. Plus he's made a lot of strategic moves and played a good social game. So it would not be a crime whatsoever if he won and in fact I'd say he deserved it. Spencer winning on the other hand most certainly would be a crime. Luckily I think it would actually take a crime being committed for Spencer to walk away with the $500K. The final HOH has 3 parts. As winner of part 1 GM advances to part 3. Andy and Spencer will go head to head in part 2 over the weekend which is usually a physical comp that also requires some game knowledge. The winner of part 2 will square off with GM live on Finale night in part 3 which is usually playing a clip of Jury members making statements and then pausing it and you have to guess A or B as to how they finished their statement. Just like I said earlier today… "this could be the shortest endurance comp in the history of BB." Production really should've stuck them in the middle of a pool of honey/caramel with whoever got out first being the winner …that at least would've given us more than 15-16 minutes of action, in fact they would probably still be going at it. We've been laughing at GM all season, but she might get the last laugh. If she wins the half-a-mill, I'll bet that Nick will be the first person to greet her when she comes out of the house. To quote J. Geils, "First I Look At The Purse". No, the problem with this site, which I have stated before in a previous statement, is no one likes to be critiqued by someone on every post they put up. People like to voice their opinions and call it a day, not have their opinions picked apart on why they are wrong. Jaime, your informal tutorial on a day-to-day basis is very solid, probably the best on the Internet. Unfortunately your comment section is absolutely awful. If Andy's in F2, he will win. Where it gets interesting is if we get a GM/Spencer F2. Everyone seems to be discounting Spencer's chances at winning, but he could very easily point out that he survived nomination 8(!) times. The jury would have to weigh that against GM being the one to put up and evict Amanda. Regardless of who wins, this is probably one of the 2 or 3 worst BB seasons to date. Hilarious that GM is a F2. The broken WOMAN beat Spencer & McCrae in the roller blade endurance comp!! How hilarious is that?! I am glad Andy's ticked off...he could have probably beat her if it was only about hanging onto something. 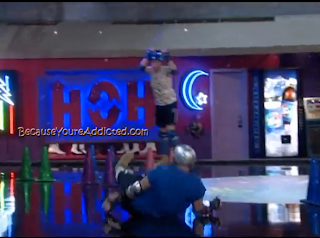 You add in the skates, bubbles & glitter and there goes Andy....the whole entire comp lasted all but 15 minutes?! What a joke!!!! I agree, Brian, it would take a crime for Spencer to beat Andy in a physical/game knowledge type of comp. Why is it that I always think that the winner of Part 1 gets to 'choose' the person who they take to the F2?? It's not their choice, though, but another comp? See?!? It SHOULD have been McCrae/Andy in the F2! If McCrae had stayed instead of Spencer or GM, he definitely would have won this skate comp, and Andy would have won Part 2, hence my dream F2! I KNEW I had something, though! Dang, how close was McCrae to winning that last veto? If he would have just stopped & studied it like Andy did........he was finished 1st.......I wonder how many of those discs McCrae would have had to change and how quickly he would have had to make the change(s) in order to win that darn veto??! Anyone know? Anyway, horseshoes & hand grenades.....there are no almosts in the end of this crazy game. Good for GM to yank one of the F2 spots from either Spencer or Andy!! Even all broken like she is.....it definitely serves them right for keeping her instead of Judd!! Hahahaha she'll be cackling her way to the bank with either 50K or (OMG) 500K. Poetic justice is all I have to say! And GM's going to need that cash as she was fired outside the house!! It makes me giggle a little that she won Part 1; how ironic is that?! You KNOW Andy was banking on this win! Even though I picked him for one of the F2, I'm finding myself lol when I think about how Andy must be angry with himself for losing to GM. Too freakin funny! :))))~ Now Andy really has to not psych himself out & choke like he did last night (also.....why is it that Andy can't walk & chew gum @ the same time??? lol he seems like he would be a little klutz!!!! hahaha! ), and he'll really have to focus & play his little heart out this weekend in Part 2!! I actually think Andy should win. The game is about lying breaking promises and being the sneakiness. He certainly has done all if that really well. I've tried nit to like GM because of previous things said and done but she's a good player. I feel Spencer had been along for the ride. Andy should have kept McCrae. He admitted on last night's show that McCrae's pitch to him to stay made a lot of sense, but he was too in love with his Exterminators alliance to think strategically. This despite the fact that we're at the end of the game and there are no more alliances. Usually at this point in the game people's decisions revolve solely around who they believe they can win against at the end. Not this bunch. oh brother - that was the endurance comp? how lame was that? They are right - MCC probably would have won that one. I'm with you Brian - Spencer will be in the second chair. lordy! I agree about GM's game but her comments were awful. She was really nasty to Candice and I don't know why. If GM or Spencer are smart, they don't go to F2 with Andy. If Andy wins final HOH then buh-bye GM. That's why Rachel always wanted floater gone. Cannot wait to see Dr. Will. My favorite BB everything. I do miss the ring-ring in DRs. Best ever. I agree! Of the three left I would cry if Andy or Spencer won! GM has won a lot of comps and made bold moves! Aside from the things she has said she played way better than the 2 boys!! Actually the comp didn't start that early. The comp started not long before the feeds came back on. Spencer said when it was over he guessed he lasted about 7 or 8 mins and that Andy and GM went another 15mins after that. It's called a discussion. Someone voices their opinions about something and others can voice theirs either in agreement or disagreement and say why. Then the 1st person is welcome to reply back and so on and maybe 1 changes their mind due to something they hadn't thought of, or perhaps they together form a new thought somewhere in the middle of their 2 opinions, or they could just agree to disagree. And anyone who truly just wanted and preferred to come on and voice their opinion and call it a day and didn't care to know what anyone else thought on that subject or any other topic would just type their opinion and wouldn't spend any of their time reading anyone else's comments or replies. So it would have no effect on them whatsoever. McCrae had 4 wrong when he buzzed his answers in. And given that the whole board fell and you had to start completely over not knowing even how many you got wrong let alone which ones combined with Andy getting it right on the 1st try it was probably impossible for him to beat Andy at that point. Also not sure if you're forgetting this but the winners of the 1st 2 comps aren't the F2. They just get to play in part 3 and the winner of that comp choses which of the other 2 to evict and which to sit next to them in the F2. So even if Andy wins part 2 if GM wins part 3 she could and probably would evict Andy and take Spencer to F2. @ Brian u cant really be suprised by how fast that comp was over. I think we all knew the ONLY endurance comp they would fight to win would be something like who could lay in bed the longest. The mental comp will be a battle of the half wits. If it's so bad, why read the comments at all? I've been on this blog since it started and I see disagreeing opinions, but I can't say I've ever seen someone "picked apart". I can't blame them. I doubt if most people have ever been on roller skates. I haven't ever been on skates of any kind. How long would you expect it to last? @Brian Thanks for the review of how the F3 works. Guess I did forget...I almost always do for some reason. Glad that's settled, thanks again! I have read this blog regularly this season and also read another one on occasion. I actually enjoy the comments on this blog so much more because it's actually a discussion and has a friendly overall tone to it. On the other site, a lot of the commenters seem extremely angry (may so than seems necessary for a game that really has no bearing on their lives), just want to vent and say they are never going to watch the show again (yeah, that's my favorite one). They tend to use lots of foul language and are at times very mean to each other (talk about having your comments ripped apart; some attack each other as well as the house guests with such intensity and rage). Plus, many of them don't present themselves as much better than the house guests they are criticizing. I enjoy reading the comments on this blog sooooo much more and feel like it's a little more civilized. No, make that a LOT more civilized! If everyone agreed and had the same opinion on Everything it wouldnt be any fun to read the comments or any reason to leave a comment. Everyone is here because they love the game and like to talk about the game with other BB Lovers. Its all in fun and if someone didnt agree with u I'm sure it wasnt personal.